Columbia, S.C. – Last week, Coastal Conservation Association South Carolina (CCA SC), the South Carolina Department of Natural Resources (SCDNR), and the Building Conservation Trust (BCT) – CCA’s national habitat program – completed the first of three projects aimed at expanding and enhancing offshore reef habitat in the Palmetto State. The 106-foot decommissioned tugboat General Oglethorpe was deployed some 30 miles off the coast of Charleston in approximately 100 feet of water, creating vital new fisheries habitat and establishing additional recreational angling opportunities for fishermen. All three of the projects will be placed at the same general depth but at different locations along the coastline. Deep-water reefs of this nature will benefit species ranging from the snapper-grouper complex to highly migratory species, providing a wide abundance of fish and marine life and making it a true destination for recreational anglers. The next deployment will be off the coast of Georgetown with another 100-foot tug and is simply awaiting favorable weather conditions. Later in the year, a final project will take place with a deployment of similar material off the coast of Beaufort/Hilton Head. These projects represent an approximate $300,000 investment by the partners. According to former crew members, the General Oglethorpe was originally commissioned on the Great Lakes as an ice breaker and was an active participant in the search for the famous Edmund Fitzgerald until called off the search due to weather conditions that evening. 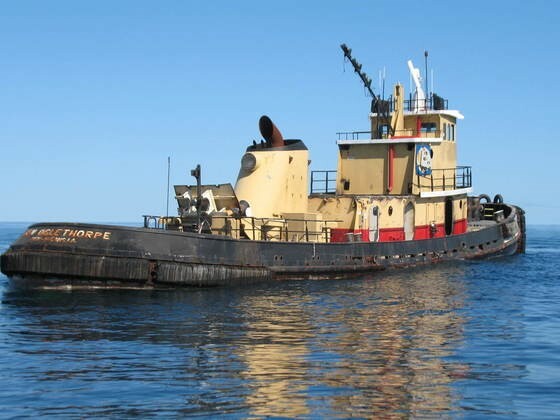 From there, the tug made its way to the West Coast and later to the East Coast where it continued to work on the Savannah River right up to the day the partners stepped in and purchased the vessel.